That may not be the best photo, I apologize. I was too eager to eat my single serving of squash casserole the other night with the rest of my “yellow dinner” (peaches and corn pudding rounded out my plate). As one of my favorite dishes, squash casserole is also great to use up some of the garden’s summer bounty. The squash gets cooked with cheese and mayo, with buttery Ritz on top for crunch. I look forward to the casserole every summer, when squash is prolific. I wish I had taken a photo of my dad’s squash and zucchini plants this year — they’re completely taking over part of our backyard, and my dad said they’re the best plants he’s grown. Heat oil in large skillet over medium heat. Add squash and onion, saute 5 minutes or until crisp-tender. Remove from heat. Meanwhile, combine egg, mayo, cheese. Stir into squash and onion mixture. Pour into a lightly greased 1 1/2 quart casserole dish. 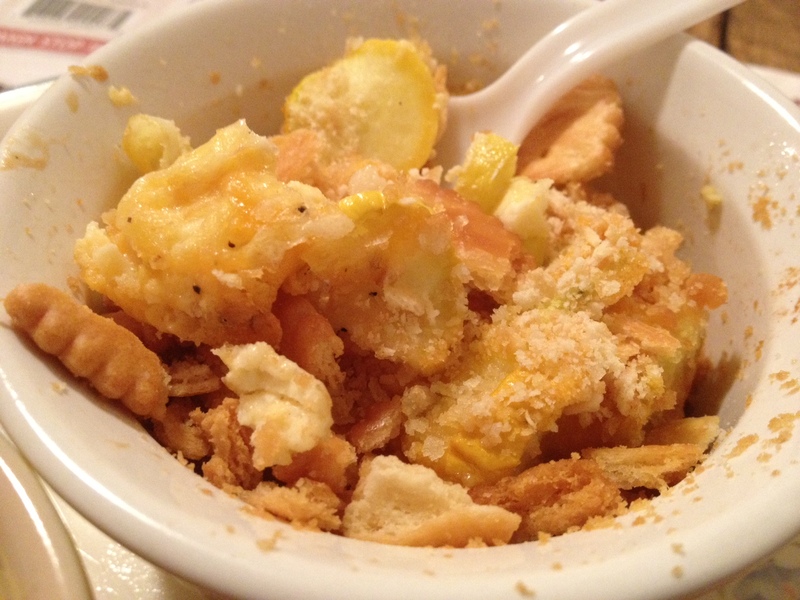 Top with crackers, pour melted butter on top. Bake at 350 for 30 minutes or until golden and hot throughout. Enjoy!